At the Corte Gondina hotel each of the fourteen rooms is different, unique in decoration, style and furniture. As far as possible the rooms have been designed using the original layout of the building, and all have been personalized with care and balance to offer guests the maximum comfort. These are the two most romantic rooms of the hotel and they are located in the manor house on the first or second floor. They have an area of 25 m², south facing with a balcony furnished with armchairs and a little table. They are equipped with a large four-poster bed, a big Aubusson carpet, large bathroom with shower, hair-drier, slippers, bathrobes, bath products MALIN+GOETZ, air conditioning, minibar, free wi-fi, direct line telephone, flat screen TV. Located in the manor house on the first or second floor, with an area of about 25m², east-facing. 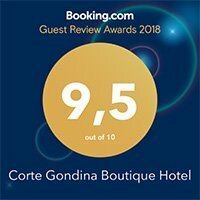 They are equipped with two French beds, Aubusson carpet, a large bathroom with shower, hair-drier, slippers, bathrobes and bath products MALIN+GOETZ, air conditioning, minibar, free wi-fi, direct line telephone, flat screen TV. These rooms have no balcony. Located in the manor house on the first or second floor, with an area of about 25m² and they are equipped with queen-size bed, living-room area and balcony furnished with armchairs and a little table. They are equipped with large bathroom with shower, hair-drier, slippers, bathrobes, bath products MALIN+GOETZ, air conditioning, minibar, free wi-fi, direct line telephone, flat screen TV. Two rooms in the manor house and six rooms around the garden. 17-22 m². South-facing, they all have direct access to the garden, queen–size or double bed, bathroom with shower, bath products MALIN+GOETZ, air conditioning, minibar, free wi-fi, direct line telephone, flat screen TV.